I Love Asian-style food and this gorgeous mango salsa is so full of flavour and such a great accompaniment to many Asian-style main courses. It’s a really fresh-tasting salsa and the perfect combination is to serve it on crisp lettuce leaves, like little gem lettuce leaves – making it into a divine salad. It has that perfect combination of sweet and sour, spicy and salty which you find in Asian food. If the mango you use isn't that sweet, you could mix a little honey into the dressing as well. This is such a good example of how amazingly tasty food can still be really low in calories and healthy. Mangoes are low in fat and a great source of beta-carotene. Chillies are super-healthy and may also help to speed up your metabolism. Another benefit is of course that it’s easy and quick to make. Do make it a little bit ahead of time though - the taste of this mango salsa improves if you leave it to “mature” for a short while before serving it. 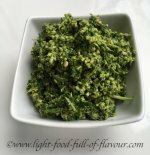 It has proved to be a hugely popular side dish whenever I have served it, and I’ve had people who are otherwise not massively keen on salads falling head over heels with this one. Take a look at my Chicken Recipes and Fish and Seafood Recipes for ideas for Asian-Style main courses which would go well with this salad. 1. 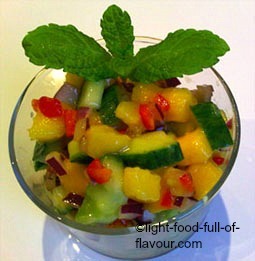 Place the mango, red onion, cucumber, chilli and mint in a bowl. Mix together the lime juice, oil, fish sauce and honey (if using), pour it over the salsa ingredients and toss everything together. Leave to stand for a while - about 30 minutes. 2. 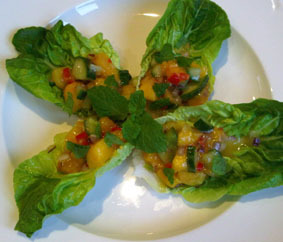 Place the gem lettuce leaves on a large plate, give the salsa a stir and add a dollop of the salsa to each lettuce leaf.